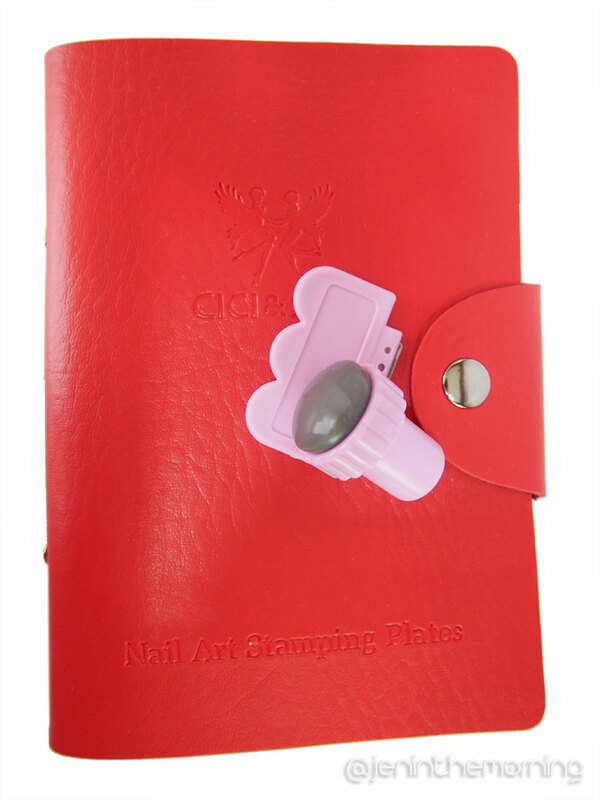 I bought my first Cici & Sisi stamping plates months and months ago when I first started to get serious about nail art. I was impressed with the variety of images and set 1 in particular had an abundance of images that I simply fell in love with! When I heard that Cici & Sisi had announced two new stamping sets, I waited on my toes to see the new images and ended up falling in love with Set 4. This set does not disappoint! This set came nicely boxed with the case, stamper and scraper immediately noticeable. Each stamping plate was covered with the standard blue protective film which must be removed prior to use. I was a little bit disappointed in the case, because it only came with enough flaps for 6 plates. My Set 1 case had a couple of extra flaps which came in handy for storing additional plates, but isn’t a huge issue. You can view full images of all of the plates at the Amazon link above. 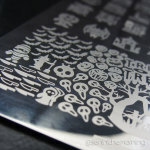 The scraper included with the set is metal-edged and I will not (and would not recommend) using it with any stamping plate because it can scratch them (use an old gift plastic card or credit card instead). The stamper on the other hand, is decent. 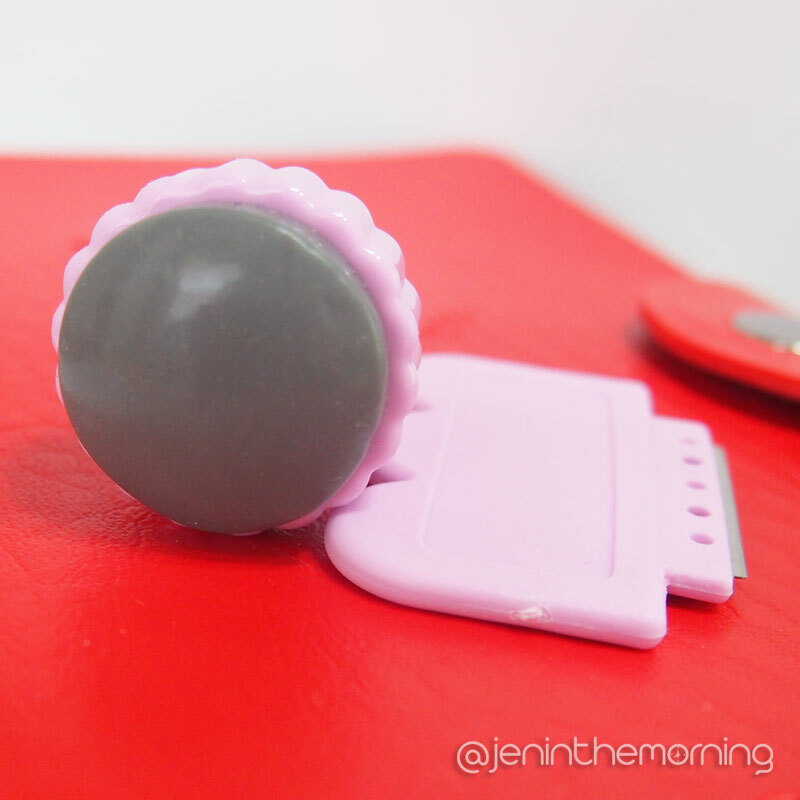 It’s a squishy stamper with a gray head, which is nice! 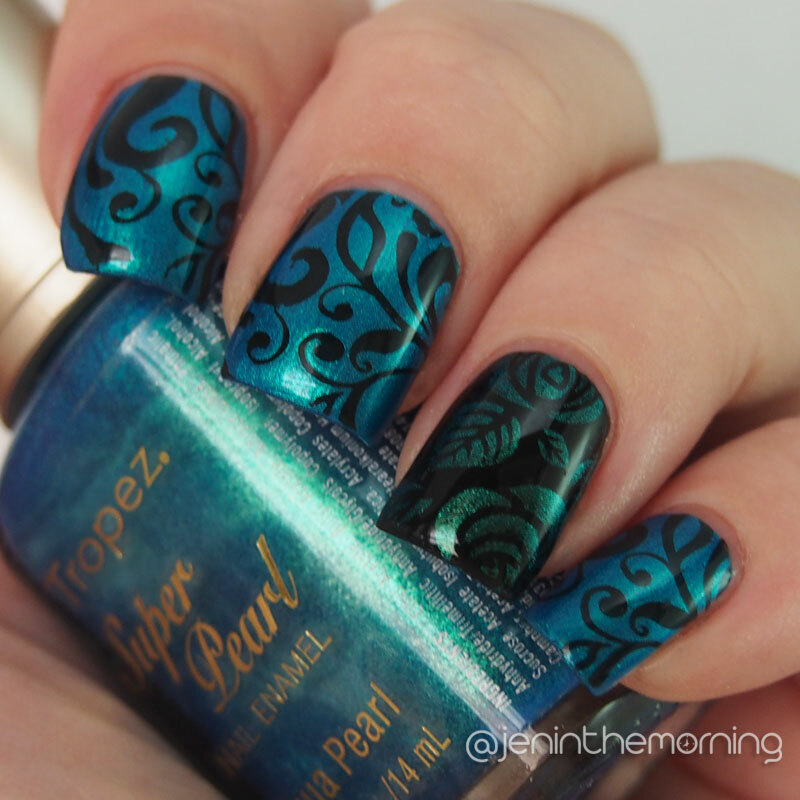 You’ll never lose sight of your white stamping. While squishy, it is not marshmallow squishy, but when properly primed, it picks up the images on the plates pretty well. The plates themselves are really lovely! Unlike set 1 and set 2, each one has a half-plate image at the top. Some of them are a bit random while some of them are a bit more unified in style – all of them tell a story and have images that will work well together. Below are stamped samples from each of the six plates in the set. For the most part, every image stamped perfectly. A couple of the images are highlighted with red and those I had trouble with. A couple of the problems were simply stamper-related. 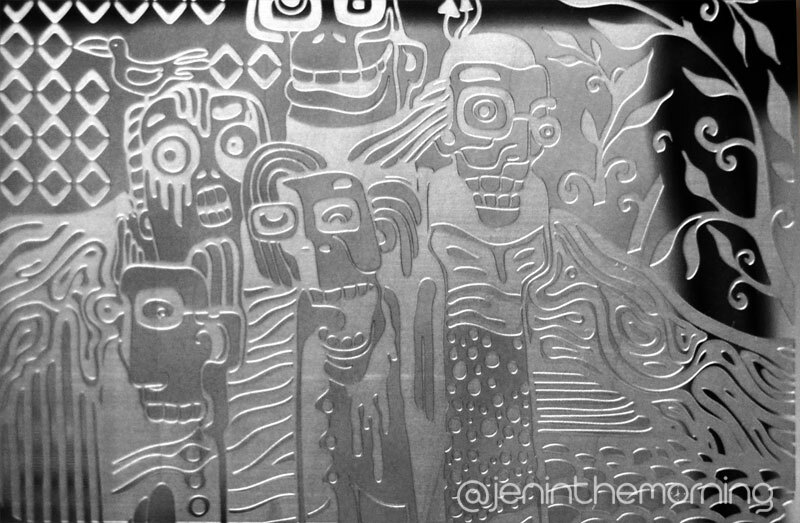 I use a marshmallow stamper and on some of the more delicate images, the lines ended up distorted, so I would recommend using a more firm stamper for those. The top row of each sample is 4 random selections from the half-plate image. All of the samples were made with my marshmallow rectangular stamper from Vivid Lacquer and Sinful Colors – Black on Black. Click on any of these images for a larger view. Plate 19 is fun, and is a good first example of how eclectic the image selection is on each plate. The half-plate image is all Paris, fashion, coffee shop (very boutique) – then at the bottom we have geometric, floral and a cat named Ruby. The top half of plate 20 has a lot of words and phrases on it – many of which are going to be difficult to put into use because they are too big to fit on a single nail and yet the wording is too close together to easily place them on separate nails to make up a single image. However, there are some cute random shapes such as stars and hearts would would be easy to pick up individually with a small stamp head (like the one on the end of a double-sided Konad). The rest of the plate is a mish-mash of Easter, confetti and (most appropriately) the HUH?! spaceship. Exactly. The two Greek key images gave me problems here. You can see how distorted they appear (but the image on the plate itself is perfect. I’m pretty convinced in this case that a firmer stamper would solve the issue, but if you only have a squishy, you may want to avoid these two images. Other than that, this has some really great images – I love the stained glass and the geometric dot pattern. Can’t forget about “Don’t Touch Me!” – My 4yo daughter thought that one was hilarious. Plate 22 is really… unique! It was the one plate I was a little meh about at first, but it has really grown on me! You can see the half-plate image from this plate above. The image is made up of four popart-meets-Walking Dead images that I am actually really loving. Pretty sure a couple of them will be making an appearance on my nails for Halloween! The rest is a potpourri of styles – I especially love the eastern style waves and clouds. I’ll save Mt. Rushmore for a patriotic holiday. This is probably my favorite plate in the set, but I just could not get clean/crisp samples of the bottom corner images. They always ended up partial or patchy. The rest of the images were spot on and this plate seems a bit more cohesive thematically than the others. Aside from the gears and seasonal plates, the rest are floral or damask/baroque style images. I absolutely adore the roses in the half-plate! The half-plate image of 24 is a lovely floral motif, however, the image is really big. I can see bits and pieces of this being useful, but some are far too large to get a cohesive stamp from. The rest of the plate has a mix of nautical/floral and geometric patterns – and I can’t omit to point out the 70’s style Summer Dayz stamp. Maybe I am just too old to appreciate the kreative spelling lol! I love the mix of styles and motifs on these plates. A few of them are a bit strange, but most of them I can definitely see finding a use for. For the most part, all the images stamped very cleanly, especially considering some of the jumbo shapes. I had no issues with scraping too much polish out of the larger images, so they still looked very opaque. Competitive pricing – $29.99/set is about $5.00 per plate. Some of the half-plate images are not very useful because of the size of the pattern or wording. You may need to have a variety of stampers to pickup all of the images well. I am in love with these plates. I like them even better than the first set. My thumbs and middle nails are pretty wide, so the larger designs are perfect for me and I don’t have to mess with trying to stretch out images with my squishy stamper. I’ve been blown away by how well some of these images with large fill space are getting picked up. If you are an avid stamper or new to it, I would definitely recommend this set, unless you have narrow nails in which case, many of these images may be too wide to be especially useful. Finally, I wanted to include a couple of samples (which I have already posted in the blog) of manicures I have worn using these new stamps! 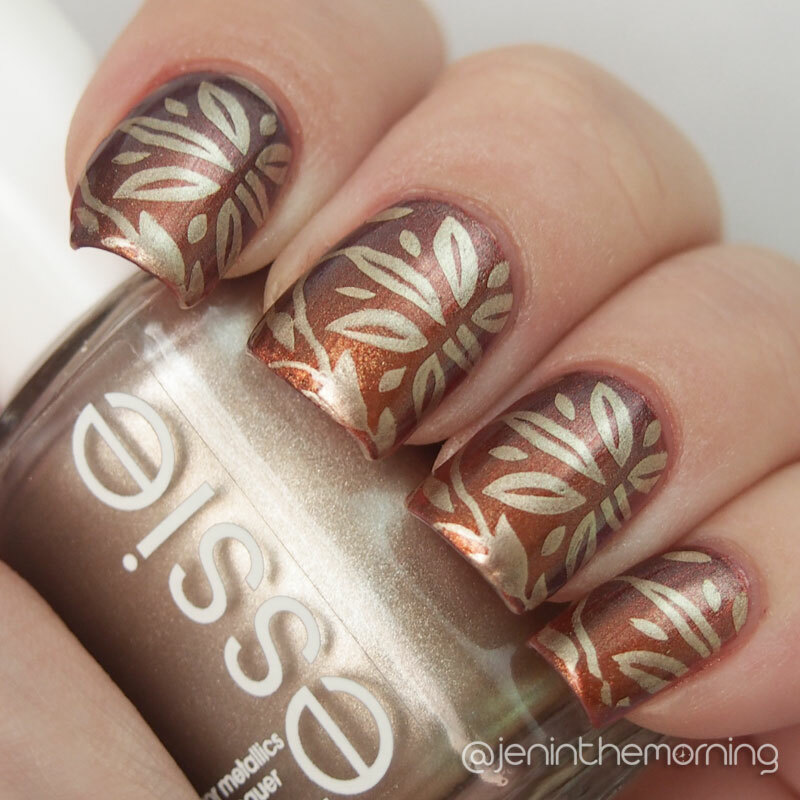 I hope this review helps you and happy stamping! LOVE!! Awesome review, thanks for the info and pics! This is a wonderful review and it’s made me very excited to get mine in the mail! I can’t wait to play with it! Thank you! Thank you! I can’t wait to see what you do with them! Awesome review! So thorough! I’ve been on the fence about these, but after reading these, they may meander their way into my plate stash before too long! lol! Obviously my love for them is oozing out of me!